Vladimir Padrino is Venezuela’s defense minister. Gerardo Rangel is a major general in the army. Nestor Reverol is a former National Guard commander who oversees the Interior and Justice Ministry. They are also, according to the U.S. Treasury, drug runners and graft-schemers who operate within the criminal enterprise that is the Nicolas Maduro regime. 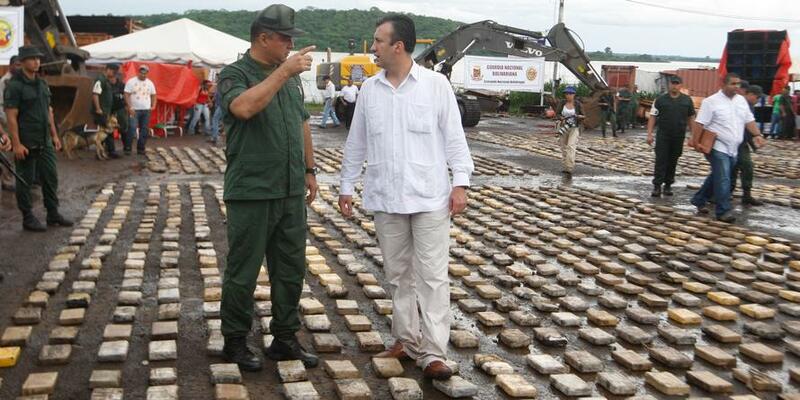 Reuters: Venezuela's then interior minister, Tareck El Aissami, right, walks over confiscated cocaine packs presented to the media in Puerto Ordaz in the southern state of Bolivar, June 26, 2011. "If Maduro falls, they fall" as one analyst cited the damning report puts it. The military commanders' fates have been so integrated into Maduro's own political survival that even if lower or middle ranking officers defect, “It would be extremely naïve to think they [the generals] are going to do something different” — given further this state of things goes back to Maduro's mentor Hugo Chavez.